It is fortunate that dogs have knee (stifle) joints only in the back legs as it is quite common for them to rupture a ligament in this joint and then require surgery. One of the cruciate ligaments – so called as there is one that runs across the joint from front to back and another from back to front, so forming a cross – is the usual one to rupture. If this happens the surgical options are either to replace it with a prosthetic one or to alter the anatomy of the stifle so that a ligament is not required. Whilst the majority of cases rupture only this ligament there are other ligaments around the stifle that can also be damaged. 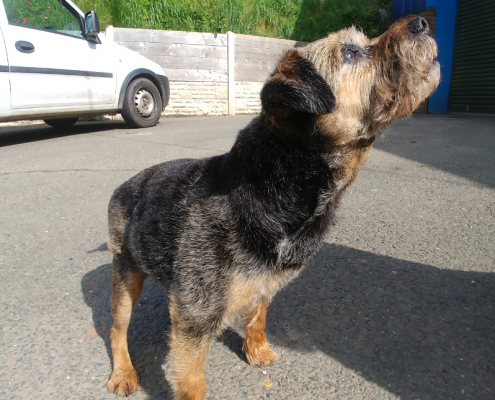 Crackle, a Border Terrier, was usually very adept at riding on the farm Gator – which is like a toughened up four wheel drive golf buggy – but one day in the summer of 2016 her poise left her and she had a nasty fall, injuring her back left leg. She was anaesthetised in order to have an X-Ray and whilst the leg was relaxed we were also able to feel for any unusual movement in joints which wouldn’t necessarily show up on the X-Ray. When the cruciate ligament breaks there is a specific limited abnormal movement in the stifle that can be felt, but Crackle’s stifle had great instability in many directions indicating damage to multiple ligaments. This uncommon and very serious injury could be dealt with in one of three ways: replace the broken ligaments; fuse the joint; or amputate. We decided on the first option, in the knowledge that if this did not stabilise the joint, the other two options would still be available. The ligament that spans the joint on the outside of the leg (the lateral collateral) and the cruciate were replaced. Although the joint was vastly improved by this there remained a small amount of generalised instability so the leg was also put in a splint. Over the next few weeks the leg was checked and re-splinted a few times. Six weeks after the operation the joint was found to be stable but the normal movement of the joint was restricted to a few degrees of flexion. It was hoped that in the subsequent weeks this would free up and a month later it had increased – but only to fifteen degrees. Crackle was using the leg to walk, however, so this result was considered acceptable, and at least as good as the alternative options. Whilst a dog tolerates amputation very well, it can be problematic if a lameness develops in the opposite leg…. Three months ago Crackle ruptured the cruciate ligament in her other leg. Fortunately this time it was only the cruciate and also enough time had elapsed for her to become stronger and more confident using the less flexible one, which now had to take all of the weight. She had surgery to replace the cruciate and the leg recovered well. Her owner says that she is happily going round the field now – on her four legs, not the Gator!